SPOILER WARNING: Fans of Magic's rich past will have those memories feel dirty and spoiled if you read about this chapter. Venser rushes to aid Karn and he notices all the dents in the floor from what must have been previous falls. 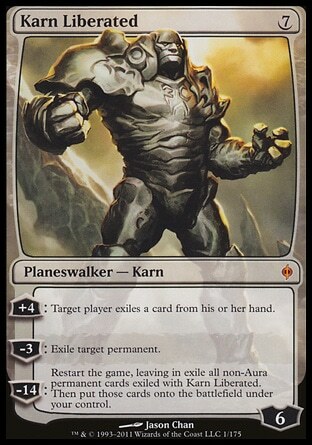 Before he can help, Karn stands on his own. Venser is happy to see him, but Karn states that he knows they're here to destroy him. That they want him to become Phyrexian. Venser tells him otherwise while Koth keeps on insisting that he wants Karn to just leave the plane completely. Venser tries to approach his friend, but it only infuriates the golem, and a shove from Karn flings him across the room where he crashes into the wall. Koth catches the silver Karn by surprise and manages to grab onto his arm and pivot in such a way that allows him to throw the golem over his shoulder. Koth then races to fallen golem ready to plunge a white hot fist into the his chest, but Elspeth manages to stop him to defend the creature that Venser has been saying this whole time is the key to saving this world. Too bad the corrupted Karn doesn't realize who he is. He takes advantage of the moment and somehow is able to knee Koth in the back, flinging him head first into another wall. He then stands and announces to Elspeth that his children will soon appear. "When they arrive I will let my children have their way with you," he said. His slit eyes moved to the fleshling, who was standing next to Elspeth. "They like skin you know." Venser was knocked down, but not out. He's wounded with a broken arm but he ignores it and continues to try to jog Karn's memory. Karn listens and wishes he could remember what Venser was saying, but the Phyrexian oil has too strong a hold on him. "You are Karn," Venser said. "...Father of Machines," Karn boomed. Elspeth joins Venser in attempted to help Karn see the light. She tells him they're here to heal him. Karn suggests that they might better serve him by becoming one of the creatures that helps hold up his column. (It would have been more impressive if he said "throne" rather than "column".) Karn then grasps Elspeth's head between both hands in an unlockable grip. He closes his silver eyes and they reopen as a terrible black. In this critical moment, the ever silent one speaks. "Tell me what you remember of your childhood," the fleshling said. The extremely out of place question gets everyone's attention. But Karn doesn't respond, so Venser volunteers. As he answers her questions he eventually he recalls that Melira always spoke to every Mirran before she healed them, and it is these questions that likely begin the special healing of hers. "We are not machines," the fleshling said. "The real secret the Phyrexians are trying to hide by keeping me in captivity is that flesh is stronger than metal. They are obsessed with flesh for this reason. They cannot copy the strength. This is a secret they do not want known." Melira gazes upon Karn and the air warps around them. The power emanating from her was undeniable. Melira is confused, and Elspeth asks if he feels any different. (From still within his grasp probably, considering we haven't been told otherwise). Oil beads all over his skin but Karn still looks at them like they're crazy. "His heart is too far gone to the contagion," the fleshling whispers. There's some more last questions to Melira and some last words with Elspeth and the original personality of Karn breaks through and he wants to believe there's hope for him yet, and so he lies down when they ask him to. 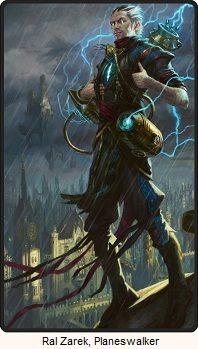 Then ultimately the elitist, quick to bicker, and drug addict of a planeswalker teleports his heart into Karn's chest. Karn has stopped moving and Venser's body drops to the ground. His limp arm releases his helmet (which he had been holding onto ever since he was knocked out , and I realize now it was specifically mentioned as being dented badly enough that he could no longer wear it so this specific scene could end this way) and it tumbles to a gradual stop as bumps into the Karn's silver leg. I'm sorry I had to write that, and I'm sorry you ended up reading it. 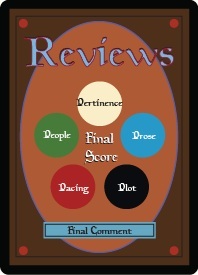 But I can't leave this tragedy of a review incomplete. He gives up his heart? Venser gives up his heart. A human heart. In a golem body. A human heart replaces a heartstone. A thing which is not made up of organic matter. And that's going to save the day!? Ok. Ok. It's called Magic for a reason. Melira can survive while missing some organs, so of course a golem can be powered by a human heart. At least it's a planeswalker's heart right? This is how Karn is reawakened!? And I must assume, how he becomes a planeswalker once more!? And now I'm supposed to want to see him save not just Mirrodin but the rest of the multiverse. Wintermute and Wizards have just single handedly tainted the last remaining piece of Urza's legacy. 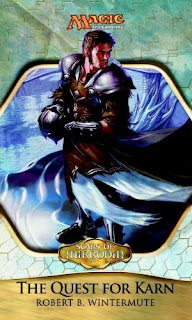 Every time I look upon Karn's planeswalker card I will forever remember that Venser's stupid heart is in that big silver chest of his. There's nothing more to say. Just one more chapter. Just put me out of my misery.